“Every story has a beginning...” or so the Star Wars: Episode I: the Phantom Menace tagline goes. 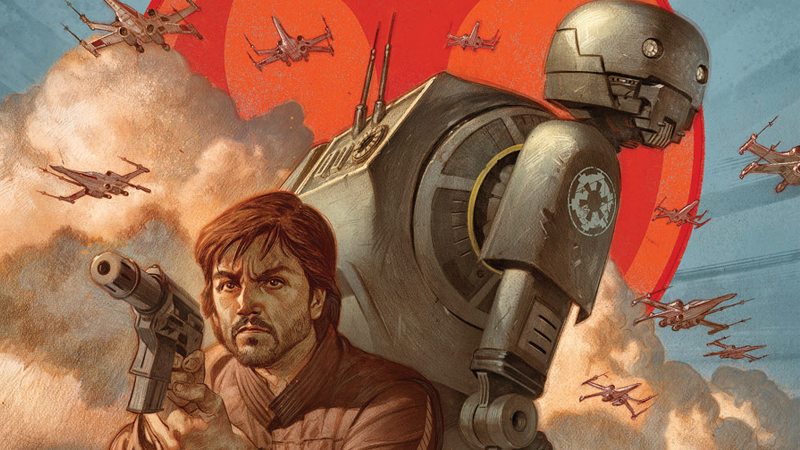 So it makes sense that while Marvel has its ongoing adaptation of Rogue One in the works, this summer it’s also going to reveal how the partnership of Rebel officer Cassian Andor and ex-Imperial droid K-2SO came to be in a new comic. Rogue One: Cassian & K-2SO, written by Duane Swierczynski with art from Fernando Blanco will be a special one-shot comic in the vein of Force Awakens’ C-3PO tale. Except, instead of being a weirdly affecting story to explain why a droid had a different colored arm in The Force Awakens, it will instead dive into the story of how Cassian first met K2—presumably while he was still serving the Empire, before Cassian re-programmed him into the snarky hero seen in Rogue One. It’s cool to see Rogue One getting some more exploration in the Disney Canon beyond the movie itself. Even though we’ve already seen how these heroes came to their end, it’s always nice to dive into their backgrounds in the ways the movie never had the time to do. Rogue One: Cassian & K-2SO will be released this August.